"[W]hy in the name of literature must I be fobbed off with long discussions of the detective's personal problems? Am I a couch?" Dr. Mawsley, the Harley Street gland specialist, was not universally liked, but everyone agreed that he knew his stuff. He was, in effect, the top man in the country for all things gland-related, which makes his sudden death all the more mysterious. You see, Mawsley was alone in a room while his butler stood outside the door. Suddenly, there comes the sound of a crash, and when the butler enters the room, he sees his master lying on the floor, dead, having given himself a fatal dose of strychnine. 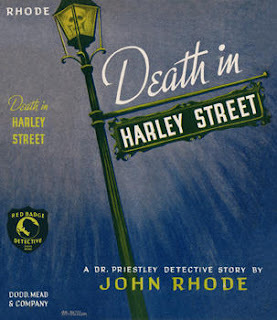 It happens in John Rhode’s Death in Harley Street. Was it suicide? Of course not—Mawsley simply wasn’t that kind of man. Utterly self-centered, his practice was thriving and he had much to look forward to. (In fact, he had just spent that evening discussing an unexpected £5,000 legacy that he had inherited.) Besides, suicide was far out of character. So was it murder? Equally unlikely, for several reasons that John Rhode details thoroughly (but which I can’t afford to go into). So it must have been an accident. But how could such an eminent doctor make such a stupid mistake and willingly give himself a lethal injection? Dr. Priestley therefore deduces that this murder was the result of neither accident, nor suicide, nor murder—indeed, this is the Fourth Dimension of crime! 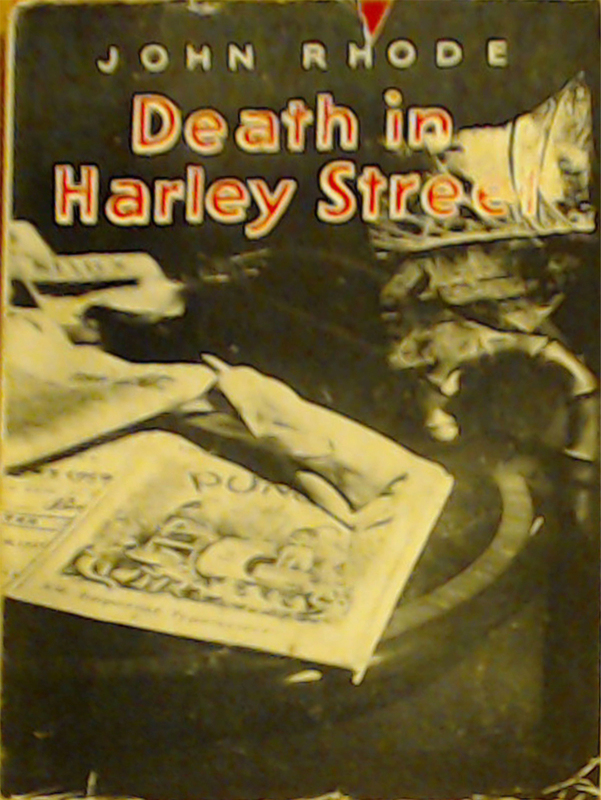 Death in Harley Street has got one of the most ingenious mystery plots I’ve ever come across. The central mystery—just how did the doctor make his lethal mistake?—has got a pleasantly original and wholly plausible solution. (I really wonder why this plot device hasn’t been ripped off in any of the books I’ve read thus far.) The clueing is also strictly fair-play. Unfortunately, the book’s pace is non-existent. This is a very, very static book. Almost everything is a conversation. Even the murder takes place off-stage, with Priestley only finding out about the problem after the fact, so the murder is part of a conversation as well! Some of the conversations are interesting, but reading a book where nothing conversations happen gets dull fairly quickly. You have to set your mind to it, but it can still be a difficult read when the going is slow. I wonder if this was an attempt by John Rhode to tell an ingenious mystery with more complex characters. After all, although the victim was a wholly unpleasant person, we see that some people will miss him, such as an elderly patient of Dr. Oldland’s, whose last hope lay is Dr. Mawsley and who is now for all intents and purposes dying of a condition no one else knows how to treat. The ending also throws new light on some characters, and I couldn’t help but agreeing heartily with Dr. Priestley’s final line. Unfortunately, if this indeed was John Rhode’s intent, it didn’t work. This is mainly because the book’s lack of pacing really ruins it. I quickly figured out one part of the solution – I dare not say what, but suffice to say most readers will spot this one thing. (In fact, until I read the conclusion for myself I was afraid previous reviews were over-hyping the book’s ingenuity.) But despite the book’s complete lack of pacing, I found myself enjoying it quite a bit. The solution is very ingenious, and although the book can be a chore to read at times it’s worth the journey. It might not be the most exciting John Rhode, but in terms of ingenuity, it’s one of the best I’ve come across thus far. (Of course, I’m biased, since I really liked the nature of the solution to begin with.) 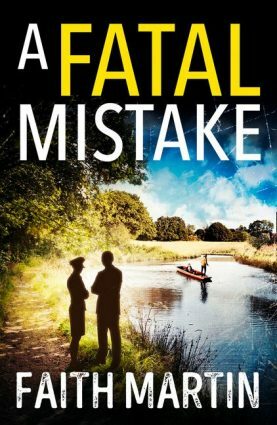 I tend to agree with Messrs. Barzun and Taylor, although I wouldn’t go so far as to call this one “surely the best of the lot” as they do in A Catalogue of Crime. But purely puzzle-plot-wise, this is a tour de force. I think this is a very fair review and a good title too! I may not have done enough with this book in Masters, but the pace is an issue for me. 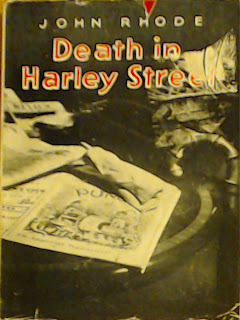 I think this may have been Street's stab at a Murder in Retrospect type Christie novel. There's potentially strong character interest but it's not dramatically sufficient. From the same period I prefer say The Lake House, even though the plot is definitely not as original. It did surprise me that you glazed over this one in your book. But the brief snippet was quite fascinating and that sucked me in right enough. "One of his most ingenious" by John Rhode standards is quite high indeed!